New from Sarah Vedeler Designs Featuring Sarahs unique and beautiful Embroidered Applique, this collection includes instructions to make a 64 diameter circular quilt, a 40 diameter circular quilt and various pillows. Great potential for classes start with a pillow as a beginners class, or create the 64 diameter quilt as a BOM over 68 months for both beginners and advanced students. 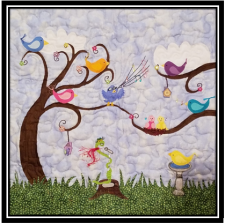 Uses the new AccuQuilt Heather Feather dies which can also be used for Heather Feather by Sarah Vedeler Designs.